Tom Petty -- kominn inn úr kuldanum ásamt hljómsveit sinni. Tom Petty has come in from the cold with his band. There are a lot of obstacles that a band has to overcome in order to make it to the top. It is not enough to be bad. Sometimes it is not even enough to be good. There are a lot of very good bands that just never seem to establish an identity of their own. There is no telling how long the careers of Tom Petty and the Heartbreakers were held back because I kept getting them mixed up with Graham Parker and the Rumour. 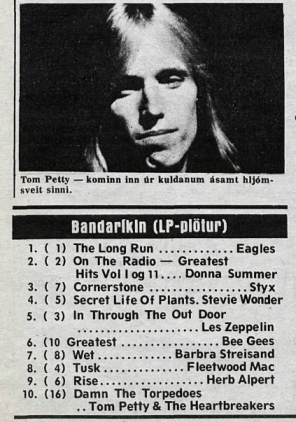 Damn the Torpedoes (Backstreet/MCA) is the album which should finally put Petty and his band above the pack. It couldn't happen to a better kind of rock 'n' roll, either. Petty combines the melodic rock of the '60s with the power of rock today. Rock and Roll standard bearer Bruce Springsteen is getting some good competition from Florida-born Tom Petty and his Heartbreakers with the release of the group's latest album, "Damn the Torpedoes." LOS ANGELES -- Ever since his "Born to Run" album in 1975, Bruce Springsteen has upheld the idealistic tradition of American rock 'n' roll virtually by himself. Talking Heads, the Cars and other U.S. rockers have arrived with invigorating sounds, but none has embraced as fully as Springsteen the liberating, rock-as-inspiration stance that Elvis Presley and Buddy Holly introduced to the music in the 1950s. Springsteen now has an ally. Tom Petty's "Damn the Torpedoes," just released on MCA's Backstreet label, is the most passionate American rock LP since Springsteen's "Darkness on the Edge of Town" in 1978. Petty's music isn't as majestically designed as Springsteen's and "Torpedoes" has weak spots, but the thrust of the nine-song collection echoes the self-affirmation found in the best rock. It's music with vitality and purpose. There are a lot of obstabcles that a band has to overcome to make it to the top. It is not enough just to be bad. "Damn the Torpedoes" (Backstreet/MCA) is the album which should finally put Petty and his band above the pack.